Orlando Tercero, the suspect in Haley Anderson’s homicide, allegedly slashed Anderson’s tires outside her West Side residence on Sept. 16, according to a police report obtained by Pipe Dream. The incident was investigated as criminal mischief and caused roughly $600 in damage to Anderson’s car. Anderson declined to press charges and told police she would attempt to resolve the matter civilly. Tercero was not arrested. The police report also includes details about Anderson’s relationship to Tercero, who had been romantically involved with Anderson before her death. According to the police report, Anderson and Tercero had dated for a short period of time, and on Sept. 15, Anderson attended a party at Tercero’s residence where he confronted her about dating one of his friends. Tercero is suspected of killing Anderson, a fellow 22-year-old nursing student at BU, and fleeing to Nicaragua on an international flight. He was apprehended Tuesday at the Hospital de León and received medical attention for self-inflicted injuries, the Nicaraguan National Police said in a press statement. 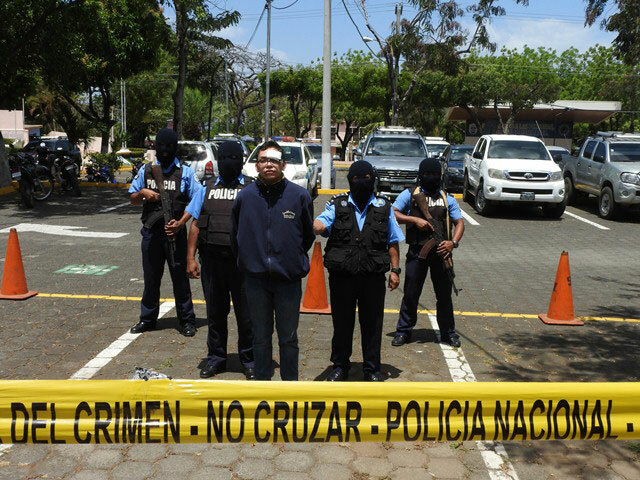 Police said the U.S. Department of State was informed of Tercero’s capture, and he was transferred to the Directorate of Judicial Assistance, a prison also know as El Chipote, in Managua, Nicaragua. He was born in Chinandega, Nicaragua, where he lived until he graduated school, according to El Nuevo Diario, a Nicaraguan news source. He holds dual citizenship in Nicaragua and the United States, according to The Associated Press. Tercero has hired an attorney, and will be represented by Michael Bachner, a criminal defense lawyer in New York City. “Orlando is presently now being detained in Nicaragua, subject to further investigation,” Bachner said. In a letter written on Thursday to Deputy U.S. Secretary of State John Sullivan, U.S. Sen. Chuck Schumer urged the U.S. Department of State to make the case a top priority. The letter from Schumer is reminiscent of a different case from May 2008, when an attack in the Rathskeller Pub, a bar in Downtown Binghamton, left a BU student in a coma with a fractured skull. One suspect in the case, Miladin Kovacevic, fled to Serbia after being released on bail, successfully avoiding extradition. In 2010, Schumer voiced his opposition to a plea deal that sentenced Kovacevic to two years in a Serbian prison. In a statement on Wednesday, Broome County District Attorney Steve Cornwell said his office will be seeking an indictment from a grand jury in the case, and after one is granted, will file a warrant for Tercero’s arrest. According to Cornwell, the warrant will be presented to the U.S. Department of State, and his office will call on the Nicaraguan government to extradite Tercero.